The Arts Consortium LA is the creation of the Mary Pickford Foundation. 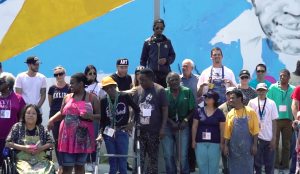 The Consortium helps forge social change and growth in Los Angeles by utilizing the artistic process. It provides existing community-based art organizations an opportunity to expand the scope of their work while enhancing creative growth and self-determination for the participating individuals. Through this collaborative process, artists are learning tangible skills: how to utilize new media tools, materials, along with other art production methodologies. 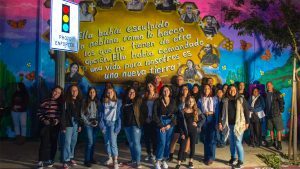 “Migrant Mamas” mural project and “Las Fotos” featuring photography mentors inspire multi-generational support systems that can change lives. Watch to see how art and social justice can intersect to motivate and encourage. In the Spring 2018 Fine Art course Socially Engaged Art, taught by Assistant Professor Olga Koumoundouros, Fine Art students collaborated with students from Art Division, a nonprofit organization by Los Angeles’ MacArthur Park dedicated to training and supporting underserved youth committed to studying the visual arts. ECF is a MPF created collaboration between 10 students enrolled in the Socially Engaged Art class at Art Center College of Design in Pasadena and 6 artists attending the Exceptional Children’s Foundation (ECF), an organization that works with adult artists with developmental disabilities in a studio setting. 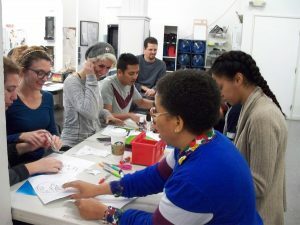 At their downtown Los Angeles location, artists have access to art educators as well as space to paint, make ceramic objects and do printmaking. During the project creation, sincere rapport and care was cultivated within the collaborative groups while allowing for Art Center Students to learn about the many different ways people communicate. These relationships were developed in tandem with the introduction to video, performance art, video game construction, large scale painting or Zine printing. As was evidenced in the final exhibition, the impact of creating communally expanded everyone’s art making processes. That, as well as the new friendships created, made for a very compelling experience for all the participants that are bound to impact them now and long into the future. 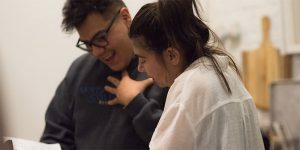 MPF created a collaboration between Art Center College of Design in Pasadena with the young adult artists that participate in Art Division, a community arts center serving the multiple communities that comprise the MacArthur Park neighborhood of Los Angeles. The students from ACCD’s Socially Engaged Art class will jointly produce art reflecting on the social geography of their fast changing neighborhood. The use of video, sound, installation and/or performance in addition to 2D media such as drawing and painting to expand spatial and media aesthetic discourse will be encouraged. 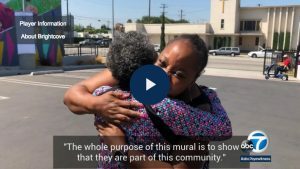 Exceptional Children’s Foundation (ECF) Art Centers is partnering with the Mary Pickford Foundation to further efforts in engaging the Los Angeles art community to create a large mural from a collaborative design by ECF and local artists. The project will be completed in late spring of 2018 which marks the Downtown Art Center’s tenth anniversary and ECF Art Center’s 50th anniversary providing studio spaces and mentorship for adult artists with developmental disabilities. We will work with a local artist to create designs that reflect the ideas, images and concepts of ECF artists, other local artists and the space where our mural will be located. This project will offer community engagement, awareness of our talented artists and opportunities for them to create work on a large, public scale.